Home › Blog › What’s Your Lucky Charm? It’s no secret that it helps to have a little luck when you sit down at your favorite game. Whether it’s a small memento you keep in your pocket or a special routine before you spin, we wanted to know where your luck comes from. So, we asked our Facebook fans a few weeks ago and here are a few of our favorite responses! Many of our patrons have a lucky item of clothing that they are sure to wear every time they sit down to play here at WinStar. Special hats, shirts and socks were just a few of the most common pieces clothing worn by our patrons to give them an extra boost. Sometimes the luck comes from something small. Many gamers carry around their lucky charms in their pockets – coins, lockets and even a stuffed frog! Often, it’s not what you bring with you, but who. Many said friends and family are all good luck charms and will ensure they have a great day. “Spending time with my husband is my lucky charm,” said Sue B. They enjoy each other’s company so much, in fact, that they spent their 33rd wedding anniversary with us! If you don’t have a lucky charm to bring with you, maybe a meal will get you in the gaming mood. Word on the street is Panda Express and Kirby’s Prime Steakhouse are both good luck before you hit the games! We even heard about a few unique pre-gaming rituals. “I listen to “Thunderstruck” by AC/DC just before I get to the casino and always chew on ice while I’m playing,” Jasmine H. said. But with all the mementos and rituals our patrons have to increase their odds, there’s one that seems to stand out from the crowd. 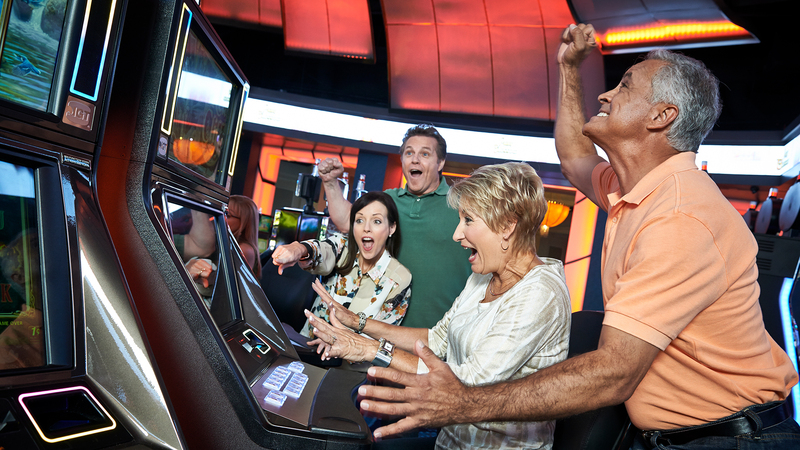 Whether it’s a lucky hat, a small coin you keep in your pocket or simply showing up with a smile on your face, you’re sure to find a lucky spot among our more than 8,300 electronic and table games. Everyone can have a lucky charm, you just have to find yours!